Ohio State-Maryland is Most-Watched College Football Game of Week 12; Audience Peaks at More Than Nine Million throughout Fourth Quarter and Overtime - ESPN Press Room U.S.
ABC and ESPN led the way among college football telecasts in week 12, as ABC aired the three most-watched games across all networks and ESPN televised the most-watched game on cable. 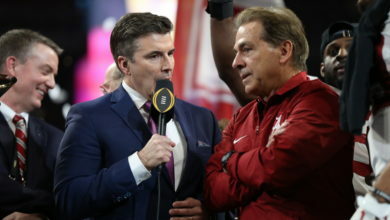 ABC also set multi-year highs across ESPN/ABC in their noon ET window, while simultaneously airing the most-watched telecast of the day on any network (sports and non-sports) in key male demos. The significant day for the network continued into prime-time, as ABC’s Saturday Night Football ‘won the night’ among all networks – both broadcast and cable – in multiple key demos. ABC’s Ohio State at Maryland telecast (noon ET) was the most-viewed college football game of the week, drawing a total live audience of 5,685,000 viewers, spiking at more than nine million viewers for approximately 40 minutes while the Buckeyes and Terrapins played into the fourth quarter and overtime (3:30-4:08 p.m.) The game’s highest audience was reached during the overtime period, as an average of 9.2 million viewers tuned in (4-4:08 p.m.). The Big Ten game audience is among just the few college football games this season to have a peak audience surpass the nine million-viewer threshold. Most-Watched Among Key Demos: Game was the most-viewed telecast of the day — sports and non-sports — among males 18-34, 18-49, 25-54 and persons 18-34. Among The Best Audiences: The game ranks among the most-watched of the season. Now, season to date, ABC/ESPN have aired seven of the 13 most-watched games across all networks. ABC’s West Virginia at Oklahoma State game (3:30 p.m.) delivered a total live audience of 3,948,000 viewers, college football’s second most-watched game of the day across all networks, providing ABC a 19% increase in audience from the comparable window last season (Illinois at Ohio State). For ABC, the Mountaineers-Cowboys game ranks as ABC’s most-viewed late afternoon window since the opening week of the season and topped the broadcast competition in the same window by 97%, 93%, and 36%, respectively. ABC/ESPN continued its season-long prime-time success this week, as ABC’s Saturday Night Football delivered the most-watched game of the night when Cincinnati at UCF (8 p.m.) earned a total live audience of 3,124,000 viewers. The airing of the American Athletic game marks the 10th time this season ESPN/ABC has aired the most-watched primetime game in the sport. The AAC showdown also led ABC to ‘win the night’ among all key male and adult demos (males 18-34, 18-49, 25-54, and persons 18-34, 18-49, 25-54). The prime-time game bookended a day in Orlando, Fla., which began with College GameDay Built by The Home Depot (9 a.m.- noon) from the UCF campus, which drew 1,904,000 viewers across ESPN and ESPNU while also delivering a significant rating in the Knights’ home market. ESPN’s prime-time telecast of Duke at Clemson (7 p.m.) drew a Nielsen total live audience of 2,452,000 viewers, the most-watched cable telecast of the week. Now, 12 weeks into the season, ESPN has televised the most-watched cable game in each week of the season.